Hello, friends. 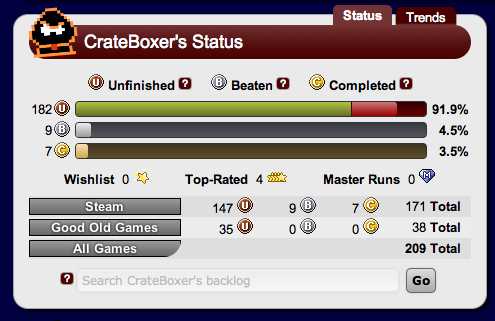 This is my new project/hobby/obsession: the Backlog Journey. I should probably explain exactly what it is, and I certainly will, but in a thoroughly roundabout way. Get used to it now, folks. It's all downhill from here. A while back I encountered the wonderful site known as Backloggery. Backloggery is a database of sorts that lets you keep a detailed record of all the video games you want to play. "Hey," said past Colin. "That sounds really useful. I'll be able to sort out just how many games I have, and bask in the glory of my collection. Kneel before me." You see, I'm a big sale guy. I love hounding the internet, scooping up games that were $50 back in the day for two or three bucks. But when I started filling in my Backloggery page, I started to realize exactly why the site is called Backloggery. Two hours and three Dr. Peppers later I was finally aware of just how many games I've bought on the cheap. According to Paypal, I had spent a little more than $400 on Steam and others since I started the account, and I have over 200 games to show for it. That's less than $2.00 per game on average. That's completely nuts. I felt like the most savvy consumer ever; a rich Texan oil baron who just struck dirt cheap crude video games. Yeehaw. That, obviously, wasn't the big scary depressing revelation. No, that's been spoiled by the graphic at the top of this post. I saw that out of all the games I've bought, I've only beaten 8.1% of them. Even worse, out of the 91.9% I haven't finished 85.7% of them have been almost untouched beyond the tutorials and a few hours mucking about in the first few levels. I probably should have seen it coming. I'm far too flippant and spontaneous to take something and stick to it (excellent blogger qualities I find (sarcasm)). But this is not the time for complaints. I mean, how am I supposed to complain about too much fun to be had? I'm not a monster, just an irresponsible spender. No, now is the time for course correction. Hence the Backlog Journey. A journey through my enormous backlog. How fitting. Hey there! I just decided to leave a comment here since Twitter is much too truncated to really say anything useful. Found your blog today and am already really digging it! I started my own blog for much the same purpose as you early this year... except it wasn't necessarily to BEAT games just to play ones that I have never ever touched before in my life. Basically, I'm a more extreme version of you and your spending habits (backloggery.com/masteroftheclaw - I stopped marking "unplayed" halfway through because it was so depressing lol!). Either way, somehow I lost my way on my own blog and now mostly write about random gaming things rather than playing through my backlog - but you kinda make me want to get back to my main task. Thanks for the spontaneous inspiration! Thanks for the kind words, and glad to know I managed to provoke some spontaneous inspiration. I'll definitely be keeping an eye on your blog. Good luck with the writing! Hey. The one rule for comments is common sense. I'm pretty relaxed about it, so just be cool and polite. Cheers! This is a place to read thoughts about the backlog of video games I've been playing. Original content ©2011-2013 by Colin Brown. Picture Window theme. Powered by Blogger.